With the new Kindle Paperwhite on the horizon, Barnes and Noble is making a move to try and keep its backlit e-ink reader relevant. In order to do that, they've dropped its price to $119, the same as the ad-supported Kindle Paperwhite. Both Target and Walmart are advertising the new, lower price for the Nook SimpleTouch with GlowLight, and it could be enticing for some shoppers. 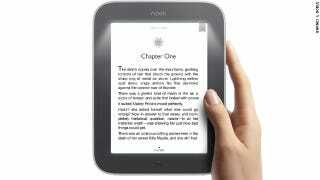 After all, the equivalent (price-wise) Paperwhite Kindle has ads, while the Nook doesn't. Not to mention the GlowLight Nook is a damn fine eReader. The Kindle Paperwhite, on the other hand, is newer, has a beautiful screen, boasts an insane battery life, and is wired in to the Amazon framework.